Romping through Ulysses by James Joyce. The story of James Joyce’s novel Ulysses is set on the 16th June 1904. This day has become known as Bloomsday, after the book’s anti-hero Leopold Bloom. It is celebrated every year around the world. 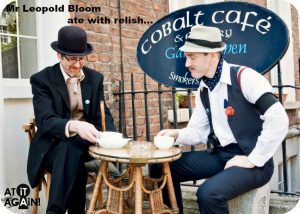 As the main characters Leopold Bloom and Stephen Dedalus journey across Dublin, they experience all of life in one day. Meanwhile, Bloom’s wife Molly is in bed entertaining man about town Blazes Boylan. We love Bloomsday because it is the only unofficial holiday that celebrates a book, its author and the city that inspired it. It’s exciting that you can walk through Dublin like through the pages of Ulysses, imagining meeting the characters along the way. 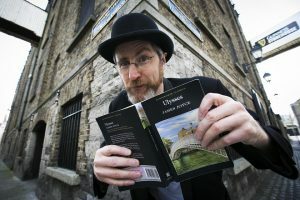 But you don’t need to live in Dublin to escape into the magical world of James Joyce’s Ulysses on the 16th June. All over the world, people celebrate Bloomsday by getting dressed up, reading or acting out scenes from Ulysses, and singing songs from Joyce. Why not enjoy breakfasts, bike rides, afternoon pints and late night naughtiness. First of all, think about dressing up all Edwardian. For the gents, wear a three piece suit and adorn your neck with a bowtie. Accessorise with spectacles, a walking stick and a yellow flower in your lapel. A hat will finish off the outfit – make it a bowler or boater. For the ladies, wear a long skirt with blouse and jacket. Enhance your curves with a corset or belt. Be your own milliner and decorate a hat with ribbons or flowers. Don’t forget your parasol to maintain your pale complexion. Why not arrange a Bloomsday breakfast with friends or family. Most famously Leopold Bloom ate with relish the inner organs of beasts and fowls. If burnt kidneys aren’t your style, go for eggs, tea, toast and honey like Stephen Dedalus or try your powers of seduction and convince someone to bring you tea and toast in bed, like Molly Bloom. Knowingly carry around a lucky potato in your pocket like Leopold Bloom. Chalk Joyce quotes on pavements guerrilla style. Walk through a familiar landscape or cityscape, observing your surroundings with fresh eyes. Pepper your conversation on 16th June with your favourite Ulysses quotes. Prepare lunch of a smelly blue cheese sandwich enhanced with mustard, washed down by some wine. Go for Gorgonzola and Burgundy for ultimate authenticity. Sit somewhere for half an hour and write a stream of consciousness about what you see, smell, hear and taste. 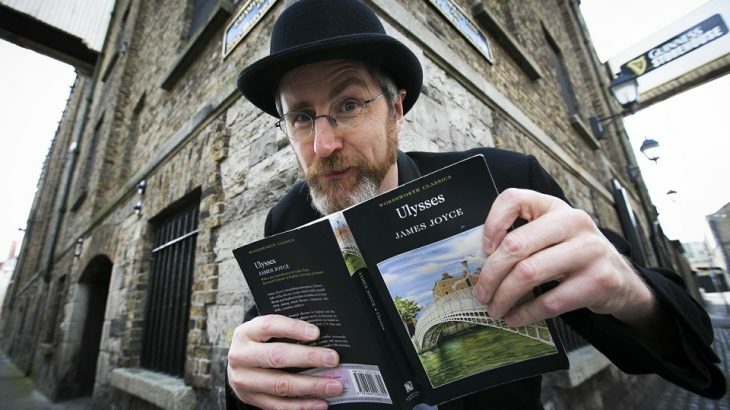 If you are feeling adventurous, why not try a Ulysses read-a-thon with some like-minded Joyce fans…. We reckon it’ll take about 48 hours of non-stop reading to get through it. Romping through Ulysses with At it Again! To plan your Bloomsday, you might fancy a copy of our illustrated Ulysses guide. Romping through Ulysses breaks down the novel by James Joyce into bite sized chunks, and gives you ideas on things to do, what to wear and is packed with insider titbits and Ulysses quotes. This blog post is by Jessica, the saucy schemer, who takes pleasure in whipping At it Again! into shape. She fell in love on Bloomsday, and has been trying to figure it out ever since. Bloomsday, Events, Irish Writers, James Joyce, Ulysses Bloomsday 2016, Dublin, Event, Famous Irish Writers, gifts for booklovers, gifts for readers, Irish Classics, Irish Literature, Irish Writers, James Joyce, literary gifts, literary travel. permalink.